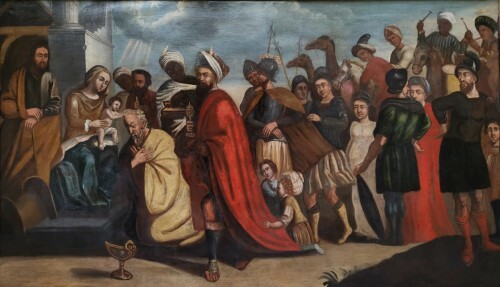 Our painting depicts an episode taken from Homer's Iliad recounting the Ulysses expedition finding Achilles disguised as a woman among the daughters of Lycomedes, king of Samos. 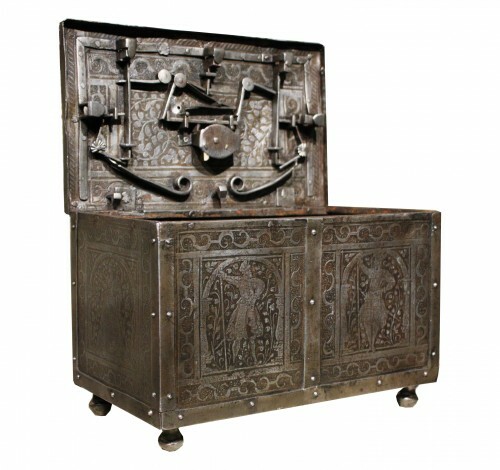 However, our work is a symbolic representation through a mythological story of a cabinet of curiosities, a kind of private museum where precious things are collected. Achille, hidden by his mother to prevent him from participating in the Trojan War, is sent to the court of King Lycomedes, the young hero is sought by Ulysses who makes a plan to bring Achilles to join the Greek army. The episode before our eyes is the discovery by Ulysses of Achilles disguised as a woman. 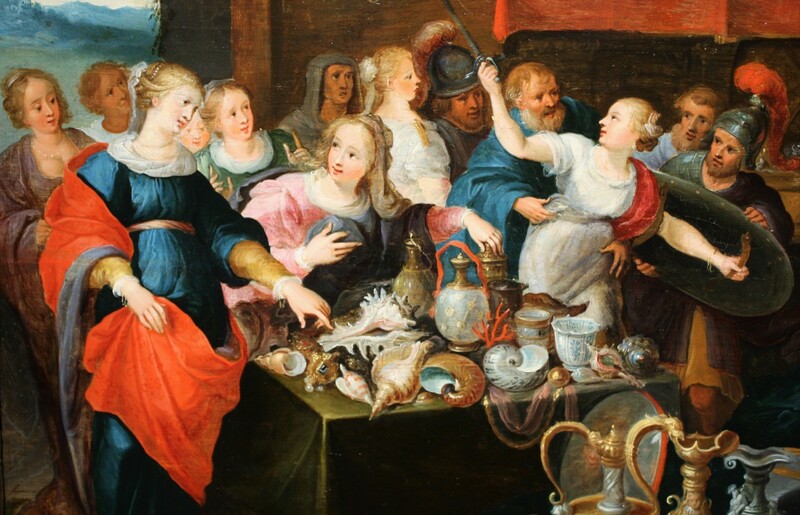 In a large room opening onto the outside, Lycomede's daughters accompanied by their followers gather around a table covered with shells, vases and flasks, amazed by so many objects presented on the ground and on a second floor. 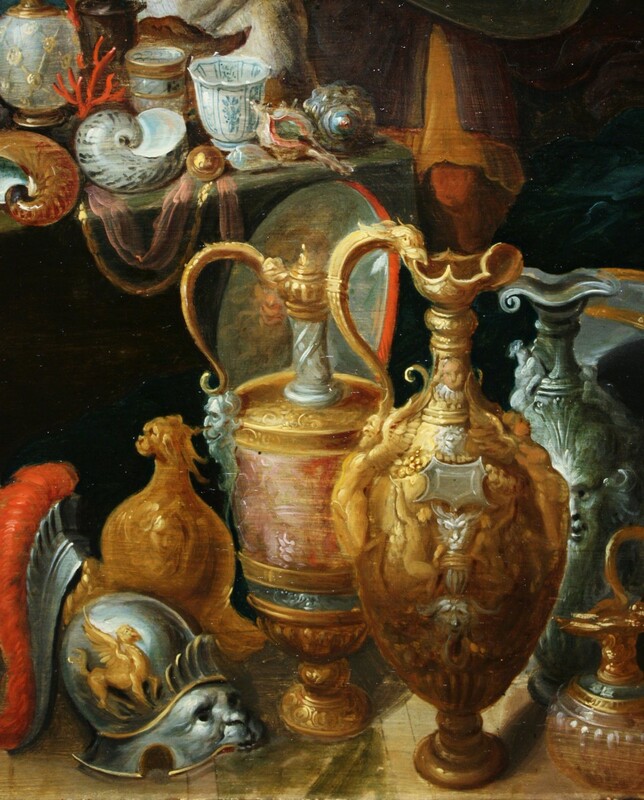 table, all these wonders were brought by merchants invited to present them precious objects, jewels and weapons. Ulysses disguised as a merchant awaits the young girls' reaction to recognize Achilles among them. 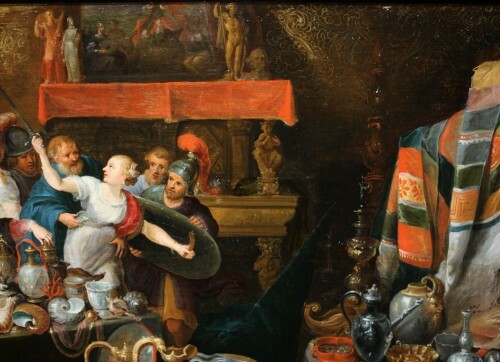 Achilles unveils himself as the only one to grab a sword and a shield. This story is only a pretext used by the painter to represent the union of extremely refined objects of art. With special care the painter realizes the very elaborate composition: in the foreground he introduces in the center the ewers in gilded metal, the cuirass and the helmet, on the right he positions the musical instruments (the lute, the violin) and the celestial globe. 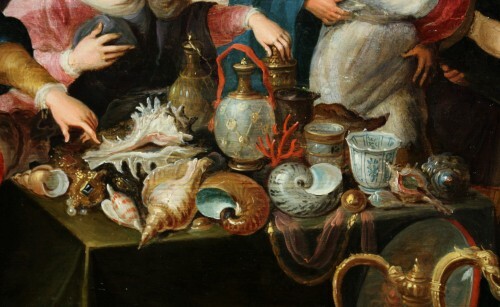 The two tables in the background are cluttered with objects, the one on the right is submerged with pottery with contorted forms, a green scarf wrapping among the objects, the left table overflowing with shells, vases, flasks and glassware. All his objects are reproduced with the meticulousness dear to the painter, by wisely handling the brush, he treats the different materials and textures by adding the luminous keys to bring depth. We find ourselves in an opulent interior of the seventeenth century with the walls stretched with gold-patterned leather and marble floor, the center of the room is furnished with a dresser decorated with statuettes and surmounted by a painting hanging on the wall. The very rich and varied palette of colors is specific to the works of Frans Francken the Younger, lover of bright colors, he uses red to create a continuity of the composition, the satin drape of the princess, the scarlet notes of the branch of the coral and ribbon of the carafe, the plume of the helmet, the stuff that adorns the top of the dresser, and the jar with vermilion notes filled with pearls. The day that enters through the opening on the left illuminates the composition, the objects form a delicate harmony of colors that warm the shimmering tones of the fabric on the right. 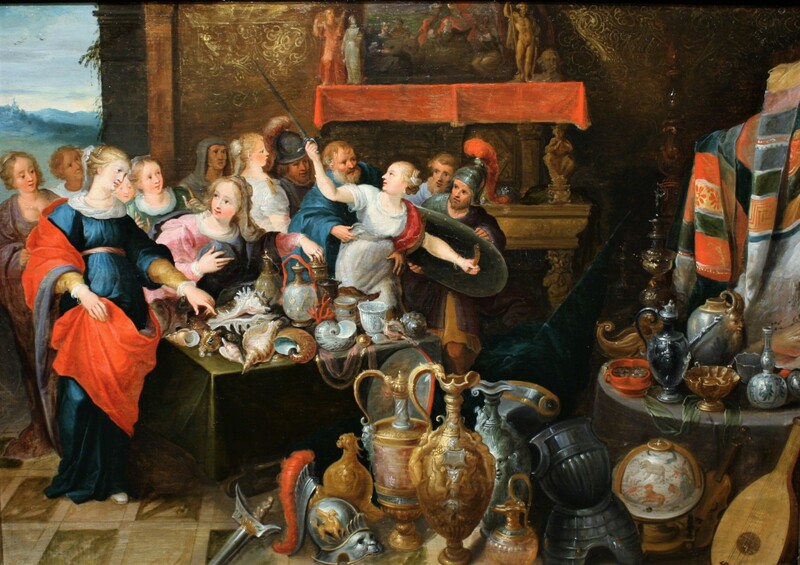 The great care in the execution, the profusion of details, the choice of the palette are just as much the characteristics of the works of Frans Francken II and his workshop, specialist of mythological and religious scenes. 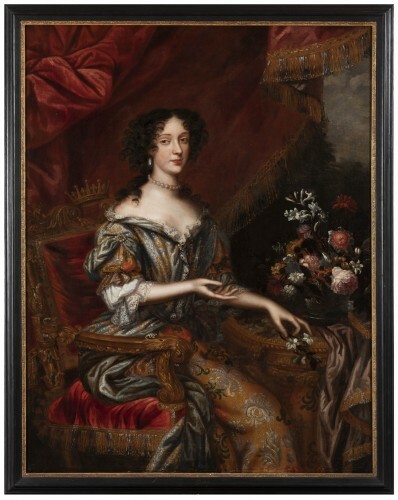 In his paintings, he interprets the entertainment and leisure activities of Antwerp's high society, evoking the sumptuous Flemish interiors, all designed to trace the image of the Cabinets d'Amateurs, the place where wealthy Antwerpers collect their collections. The precision and the prowess of his brush are wonderful to detail the characters, the decor, as well as the display of works of art. This painter has no equal to interpret on a small scale, the paintings, sculptures and curiosities that adorned the homes of contemporary patrons. 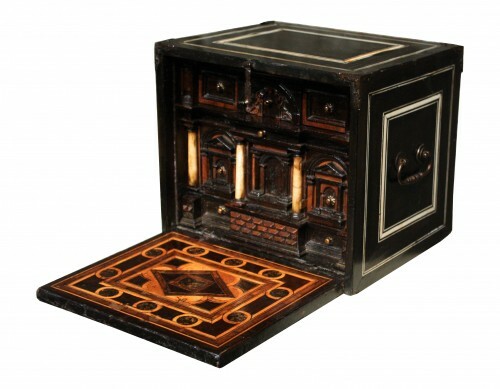 These amateur cabinets bring together objects of art and curiosities that fall under four main themes: exoticism, science, nature and artifice. Four obsessions of the man of the Renaissance, eager to appropriate the world. This is what we call the cabinets of curiosities: the mirror of the world, because their concept is an attempt to embrace at one glance the immensity of the world. artificialia (objects created by man) sculptures, pottery, ewers, vases, musical instruments, militaria. Our painting beyond the mythological scene is a tribute to all collectors and art lovers who are passionate about precious and wonderful objects. 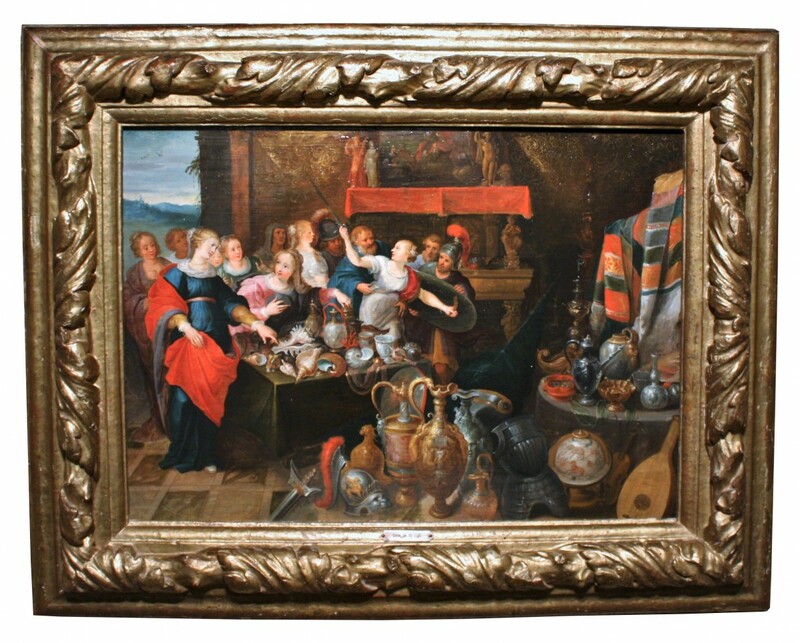 Frans Francken and his studio performed several variants similar to our work: the most famous version at the Louvre Museum, the others at the Pushkin museums in Moscow, the National Museum in Prague; auction at Koller, Zürich, 01/04/2011. Frans Francken the Younger Workshop. Antwerp, first half of the 17th century. 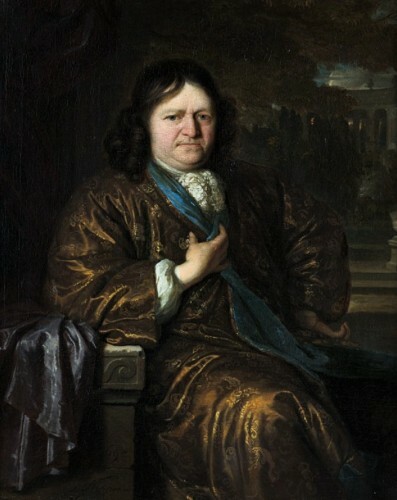 Oil on panel of oak, mark of the unidentified pannelier, as well as the mark of Antwerp: the two hands and the castle. Very pretty Italian frame of XVIIth century gilded wood and carved. Frans Francken II (1581-1642), says the Younger is part of a family of painter in Antwerp. He is the 4th son, and the most famous of Frans Francken I of which he was the pupil; it is difficult to differentiate their respective contributions, because their style is very close. His production mainly includes paintings dealing with mythological or allegorical subjects and historical and religious scenes. He also paints landscapes and still lifes, always made according to a technique so refined that it met the success near the collectors. Achilles is a famous hero of Greek mythology. Legendary warrior and renowned seducer, he is one of the main actors of the Trojan War. Son of King Peleus and Nymph Thetis, he was immersed at birth by his mother in the Styx, to make his body invulnerable. It is from this episode that comes the expression "Achilles' heel". 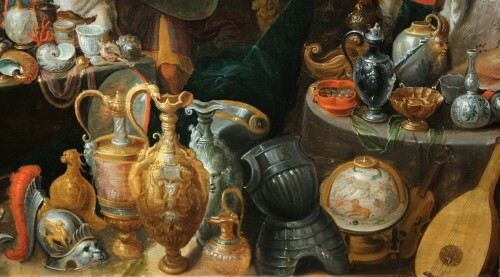 The concept of cabinet of curiosities appears in the Renaissance, emblematic of an era that rediscovers the world, science, art and history, it is first found among aristocrats who take advantage of wealth and the space they have to collect all kinds of objects and display them in a separate room. 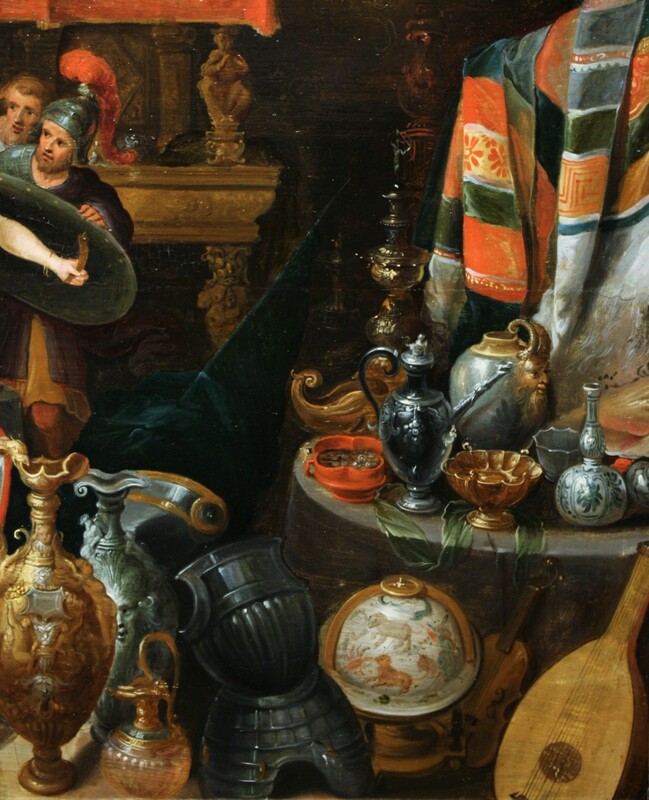 As fashion spreads, such collections appeared in Flanders and Antwerp among wealthy merchants who, in order to gain prestige, created spaces that mingled all the rarities of the world. 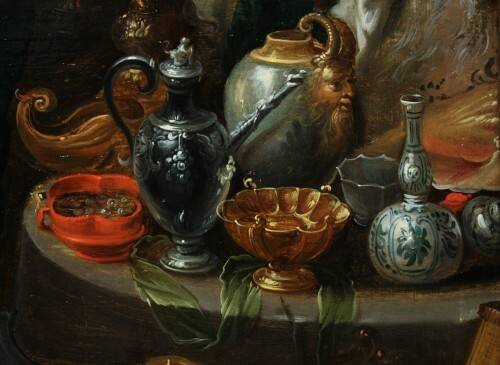 In the 17th century, like trompe l'oeil or still life, the representation of the amateur cabinet becomes a pictorial genre in itself, mixing in a skilful disorder the materials and forms.